It's no surprise that Ayaka Nishi's namesake jewelry label was inspired by her upbringing. Her mother was a Ikebana artist specializing in the craft of flower arrangement and her father worked in the medical field. These two professions helped her define a specific subject matter: nature and human anatomy. Think spiders, cobwebs and variations of the honeycomb cast in metals to make complex textures that work as bold fixtures on the body. There's also her fascination with aquatic species. Her fish scale necklace, a lush bib made with leather is a serious focal point. 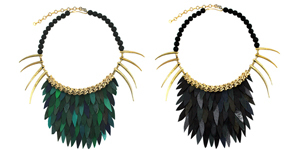 Available in green, black, red and white, the piece is balanced with lava beads and metallic horns. She's also made a long version that works as decadent trail along the chest. Learn more about this FIT graduate and made in New York label at Ayaka Nishi.